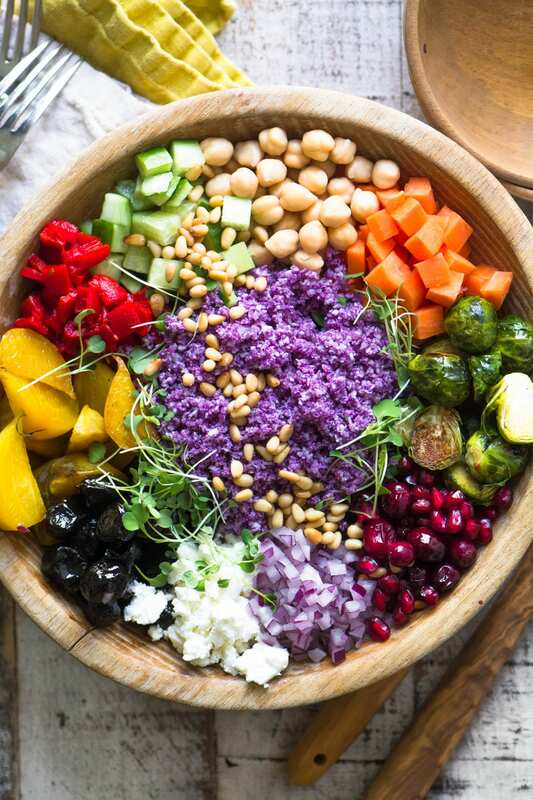 My healthy Purple Cauliflower Rice Salad is gluten free and so colorful ~ it combines roasted and raw veggies for tons of antioxidants, vitamins, and fiber! Say salad and what come to mind? Green of course. And leafy. But why can’t a salad be purple, and made with cauliflower? 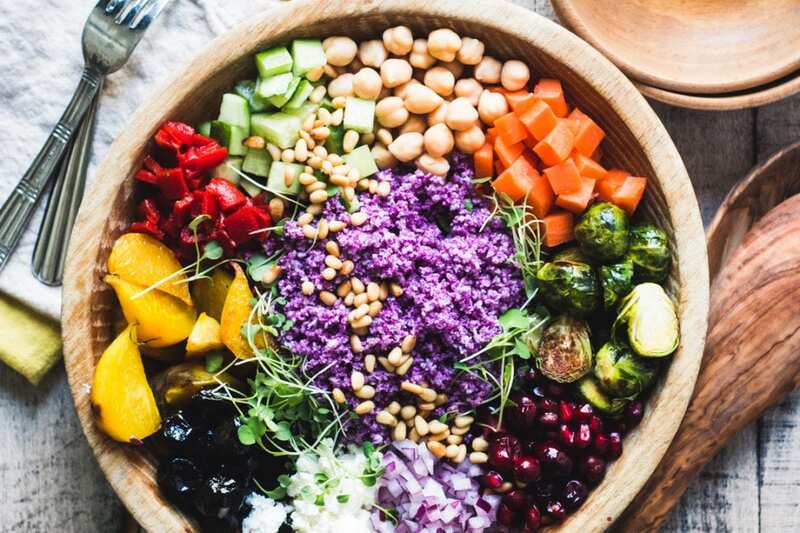 Leafy greens are great, but once the cooler weather hits we need to loosen up our definitions if we’re going to continue to get some raw veggies into our diet. 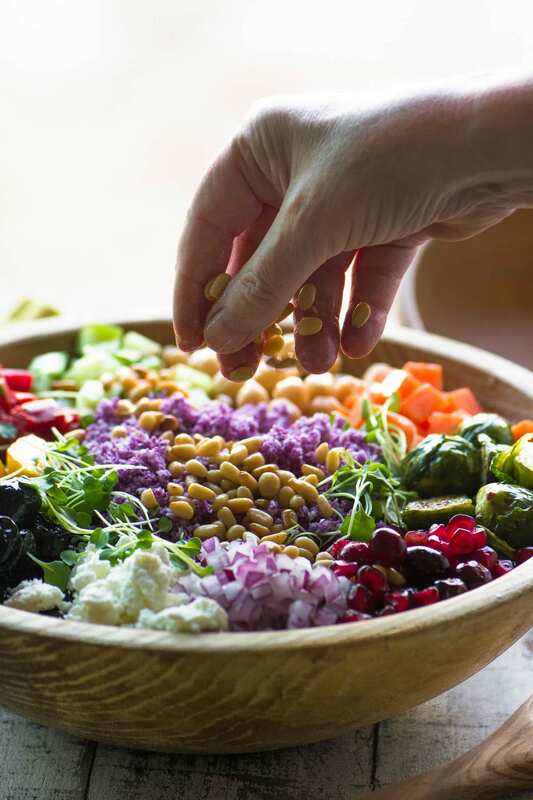 Here at tvfgi I’ve explored salads from every angle and winter salads are some of the most fun for me ~ they’re such a welcome bit of color and crunch in a sea of comfort food. Many of my winter salads are grain based, but not all. Some are built around rice, one of my favorites is a Wild Rice Salad that is always the most popular dish on our Thanksgiving table every year. Some winter salads are simply raw seasonal vegetables, like my Shaved Winter Salad with paper thin root veggies piled up in a neat little stack. 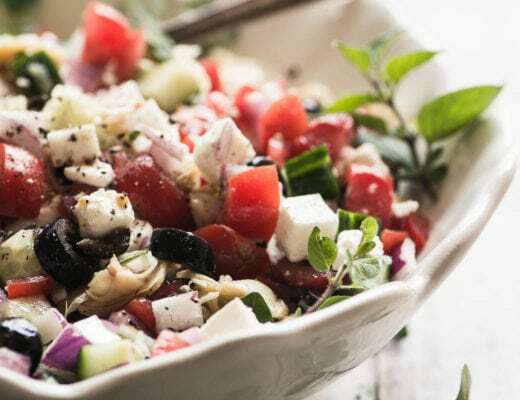 Others might feature winter fruit, like my Mediterranean inspired Spicy Citrus Salad with Olives or my Roasted Brussels Sprout and Pomelo Salad. The first time I made cauliflower rice I was skeptical, I thought it was a fun idea, but didn’t expect to love it the way I did. And I certainly didn’t expect it to be so versatile. My Cauliflower Rice Tabbouleh was such a hit in our house that I knew I wanted to try working with colored cauliflowers as well. You can find purple, orange, and green cauliflower (or broccoflower) in the supermarket and they’ll all work for making rice. All varieties are healthy, mild, and can be used interchangeably. Cauliflower rice is simple to make using a food processor. 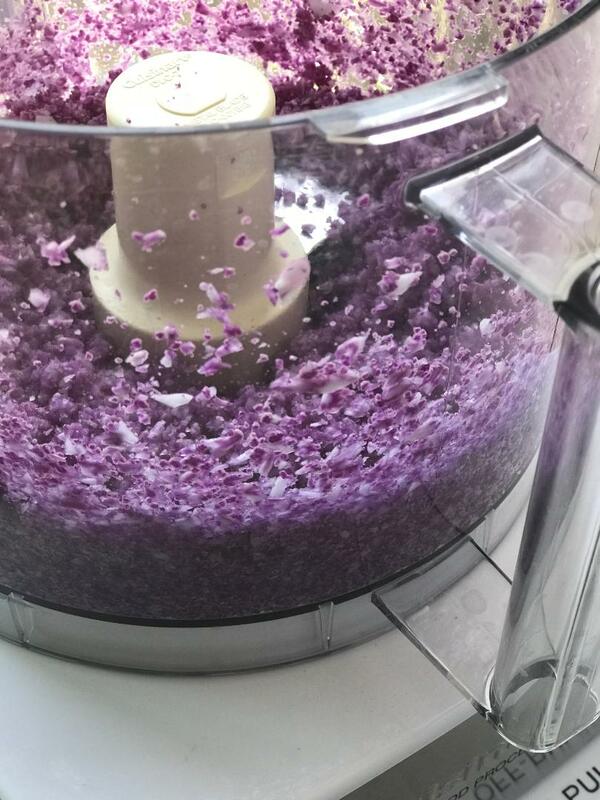 Remove the florets from a head of cauliflower and pulse in the machine until the florets break down into a grainy texture, this only take a few pulses, and it happens in under a minute. Cauliflower florets are naturally crumbly, so they break down easily. There’s a little video to show you in this post. Purple cauliflower is a variety of cauliflower that is sweet and mild, with a gorgeous violet color. The color is naturally occurring, and comes from the same healthy antioxidant that’s in red wine and red cabbage. There are all kinds of things you can do with your cauliflower rice, from fried ‘rice’ and risotto to pizza crust, but I tend to prefer it raw, in salads. It has a texture very similar to couscous, cracked wheat, or quinoa. 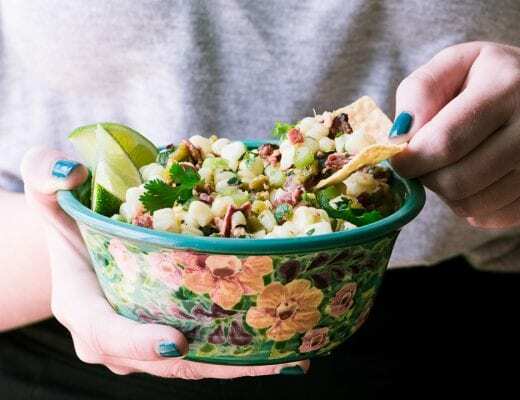 The flavor is mild enough that it doesn’t compete with other ingredients and will take on many ‘personalities’ depending on your recipe, it’s a little bit like tofu that way. 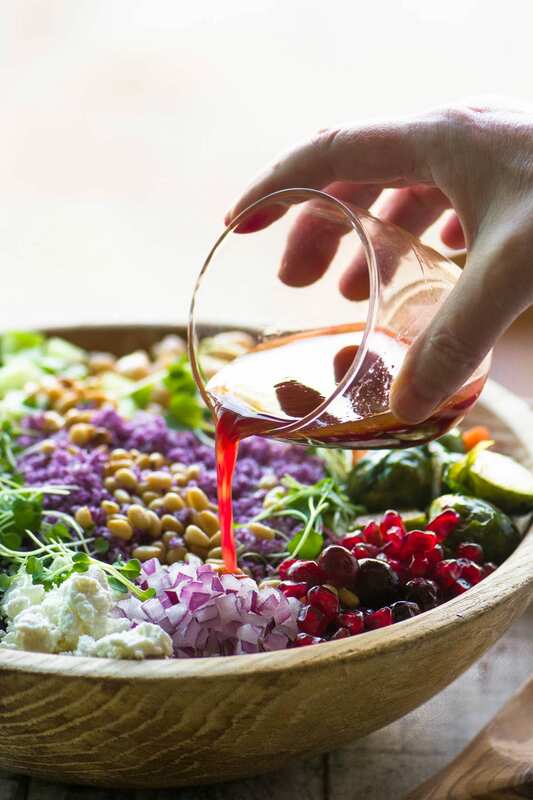 Whenever I do a super healthy salad like this one I like to include a couple of elements that add an extra dose of concentrated flavor or richness. Often that’s toasted nuts or crumbled cheese. They round out the flavor profile and make a lean salad a little more fun to eat. In this salad I’ve also added roasted beets and Brussels sprouts, both are hearty sweet veggies that really make this dish satisfying. You can use any leftover roasted vegetable you like, including winter squash, sweet potatoes, eggplant, etc. The dressing is swiped from my Winter Pansy Salad, it was just too good to use only once. 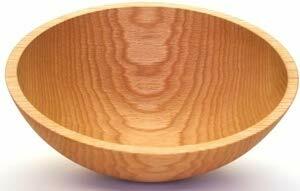 Every kitchen needs a beautiful large wooden salad bowl. 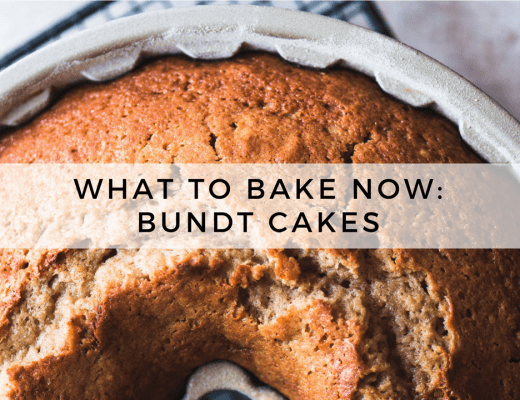 I prefer them to be wide and shallow rather than deep, so that you get a chance to show off all your gorgeous ingredients. A well made wooden salad bowl can last a lifetime, whether you buy an inexpensive bamboo bowl like the one above, or a pricier handmade version like the cherrywood bowl below. They’ll develop a patina, and just get better with age. When mine’s not doing salad duty it’s holding apples in the fall and peaches in the summer. 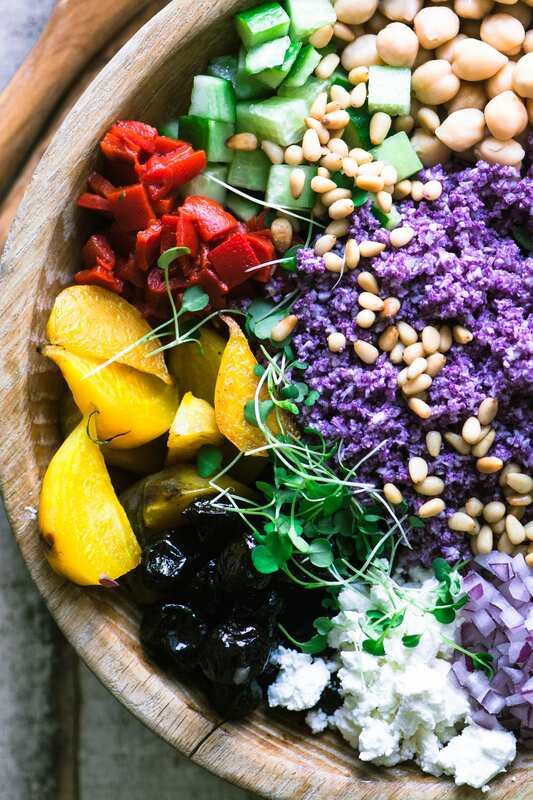 My Purple Cauliflower Rice Salad pulls together fall staples with a few Mediterranean touches in a base of colorful gluten free cauliflower rice, this dish explodes the notion of what a salad is supposed be. What a beauty!! I love this vibrant salad! Prefer food of this kind for office lunch ! Perfect as usual ! Thank you Sue ! 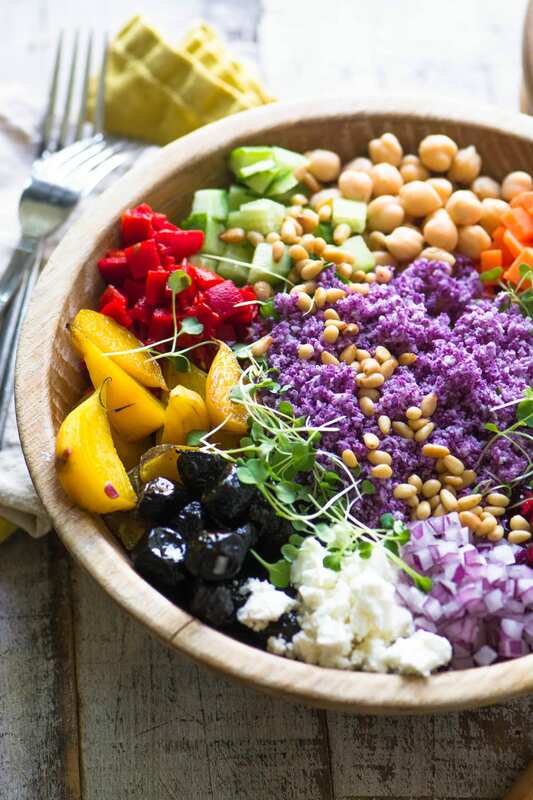 Such a colourful and yummy salad! Have a great weekend, Sue. I am totally blown away by the beauty of this salad which will certainly brighten up this rainy day. I have taken your recommendation and ordered the bamboo bowl. Can’t wait to prepare it. I know it will taste as good as it looks!!! Many thanks!